ASHEVILLE, NC: In the series finale from Asheville, the GreenJackets, Single-A affiliate of the San Francisco Giants, scored 11 runs en route to an 11-2 victory over the Asheville Tourists, Single-A affiliate of the Colorado Rockies. Augusta earns a series split and gets to 2-2 on the year with the win. Starting pitcher for Augusta, Seth Corry, worked his way out of trouble multiple times in his three innings of work. Corry walked five, while striking out seven of the 14 batters he faced. Starting in the 4th inning, the GreenJackets bats woke up in a big way over the next three frames. Shane Matheny got the scoring started with a solo home run to make it 1-0 Augusta. In the 5th inning though, the GreenJackets broke the game wide open. After Mikey Edie started the inning by bunting for a hit, Jose Layer picked up an RBI groundout later in the frame to score him. Then it was Francisco Tostado with an RBI double making it 3-0 GreenJackets. With the bases loaded, Wander Franco came up later in the inning and blasted a grand slam to give the GreenJackets a 7-0 lead, and cap off a six-run 5th inning. The offense continued to roll on in the 6th as Jose Layer received a free pass with the bases loaded to make it 8-0 Augusta. 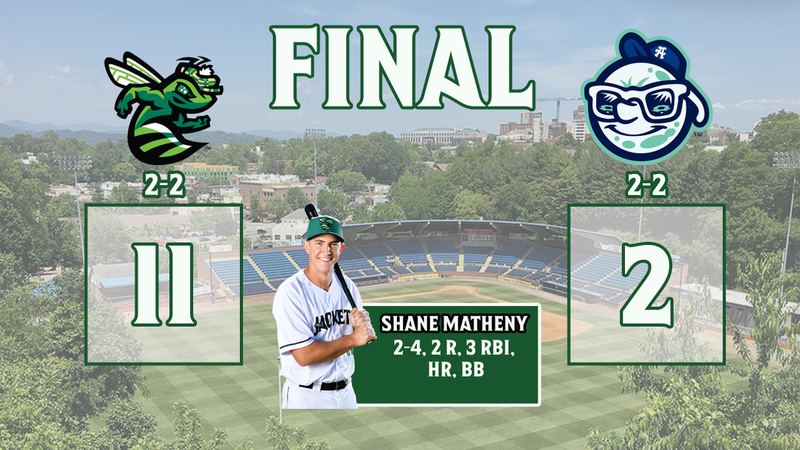 Diego Rincones followed suit with an RBI single, and it was Shane Matheny with another single to finish off the scoring for the GreenJackets at 11-0. Asheville picked up a run in the 6th and another in the 9th, but the GreenJackets won their 2nd game of the year and Keaton Winn received his first win of the young 2019 season. Winn went four-innings, while allowing just one run for the game and striking-out four. Nico Giarratano had himself a 3-for-4 game while both Shane Matheny and Diego Rincones collected two hits. 2018 didn't go the way Matheny probably would have liked after he hit just .205 in Augusta last year. But the left-handed bat from the Pacific Northwest has been one of the most productive batters for the GreenJackets so far in 2019. He cleared the 37 foot fence in right field for his first home run of the year in the 4th to help the GreenJackets get on the board. After Sunday, Matheny has boosted the average to .385 through his first four games and has the on-base percentage up to .589 on the season. The final starter in Augusta's rotation will make his first start of the year at Fluor Field as Blake Rivera toes the rubber. Rivera is ranked as the #18 Prospect in the San Francisco Giants Organization and last season, for Class-A "Short Season" Salem-Keizer, Rivera sported a 6.16 ERA over nine appearances and eight starts. Rivera only threw 19 innings for the Volcanoes after he was drafted out of Wallace State-Hanceville CC in Alabama. He was a 4th round selection in the 2018 MLB Draft. For Greenville, Brayan Bello also makes his first start of the year. Bello spent 2018 between the Dominican Summer League and the Gulf Coast League as he boasted a 7-2 record and a 1.60 ERA between the two. He signed as an International Free Agent in 2017 with the Boston Red Sox.